The Klim PowerXross glove has been rebuilt with 100 grams 3M™ Thinsulate™ Platinum Insulation on the top of hand and incorporates the GORE-TEX® Gloves + Gore grip technology in the palm to provide the best grip available. You can’t find a more comfortable, durable and highly engineered completely waterproof and insulated glove than the all-new PowerXross. Micro-injected logo and wrist strap. GORE-TEX® waterproof/breathable high performance liner. Fortunately other reviews identifying that needs gloves ran a little small. I ordered an extra large and it fit perfect. You have to try these gloves in a deluge but they do keep my hands warm down to freezing. A bit bulky, but they are cool weather gloves. These gloves do stop the wind and that's it. They are no warmer than any standard riding glove. Quality is about the same as a $20 pair from Wal-Mart. Another klim disappointment. These are great for snowbiking if you're riding when it's 20 degrees F or warmer out. Any colder I'd go with a heavier glove. other than that...they are great gloves. Klim is just overpriced. Very warm glove and excellent quality. Love the Hi-Vis color and the leather palm has a great grip. Nicely done Klim! I wear a XL glove is the large size true to fit or will this fit an XL hand? The Large size is true to fit. Do not go any smaller than you normally wear. I normally wear a large and it is snug but not uncomfortable. I think it will stretch a bit. They are still brand new. I bought XL which I normally wear. They are very very tight. 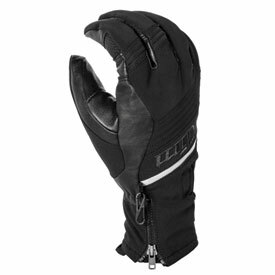 Will the gauntlet fit over the sleeve of my Klim Carlsbad jacket? The Gauntlet will not fit over the sleeve, it is designed for inside.